Today is Halloween, one of the worst days for teachers to teach. Don’t get me wrong, Halloween is lots of fun – I love seeing costumes, eating sweets, carving pumpkins, and passing out candy. But for teachers, the kids are simply too wound up! And what’s almost worse than Halloween? The day after, when the kids are totally amped up on sugar! 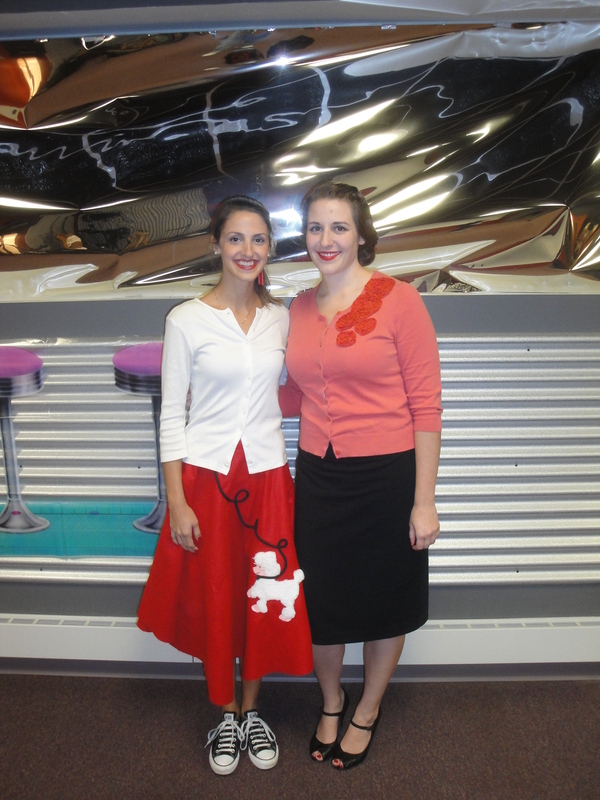 I almost wish I could have worn this to school – it is so comfy and fun! I may try to do some fall-themed activities with the kids this week. Maybe we’ll do a pumpkin glyph in math, or a fall writing assignment during Writer’s Workshop. Any fun 5th-grade appropriate ideas?? Every fall, the 5th grade class travels to Philadelphia, PA. We leave bright and early on a Wednesday morning and arrive back at school Friday evening. The kids always have a blast – for most, this is their first time away from home and it couldn’t be more exciting! There is always so much to do before the trip. After I confirm all of our reservations, I create our itinerary which gets sent to the parents so they have an idea of what our trip will look like. Each student gets a little booklet that includes rules for the trip, a list of items to pack, our itinerary, and other miscellaneous things. I have to recruit parents to chaperone, decide which kids will be together with which parents, determine how much cash to bring with me, ask parents to send in snacks for the trip, make up packets of travel games for the kids, create a phone chain of parents so that I am not calling all 14 when we arrive/depart, and so much more. While the trip is a lot of responsibility, it is honestly one of my favorite parts of teaching 5th grade at my school! I love that I get to share in this brand new experience with them. I love watching the joy on their faces as they see George Washington’s headquarters in Valley Forge or the Liberty Bell in the city. I love seeing their excitement as they eat a Philly cheesesteak for the first time. I love how much they look forward to the trip for the first two months of school and how they ask me a new question every day about it! One thing I try and emphasize with my students is how blessed they are to be able to take a trip like this. In most schools, this kind of trip would not be an option, but we are able to see the history we are learning about in person. What better way to learn than to see what you are learning about first hand?! Our trip involves so many exciting places and activities, including a visit to Valley Forge, an interactive class on Benjamin Franklin and his life, a trip to the National Constitution Center to see the powerful Freedom Rising movie and check out Signers Hall (one of the kids’ favorite places on the trip – it is full of lifesize bronze statues of the men who signed the Constitution! ), a walking tour of the city where we will visit Elfreth’s Alley, Christ Church, the US Mint, and the Liberty Bell, and a quick tour of Independence Hall. On the way home, we will visit the Daniel Boone Homestead. This is obviously my favorite field trip and every year I look forward to it as much as the kids do. How about you? What is your favorite field trip with your class?? 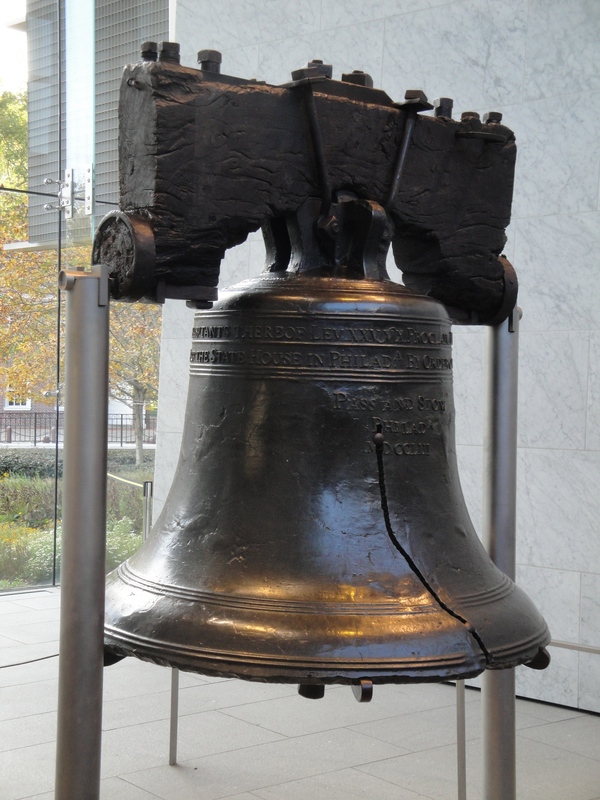 The Liberty Bell on our last trip to Philly. We are having a blast with our colonial unit! Last Thursday and Friday, I had several parents volunteer in our classroom for the afternoon. 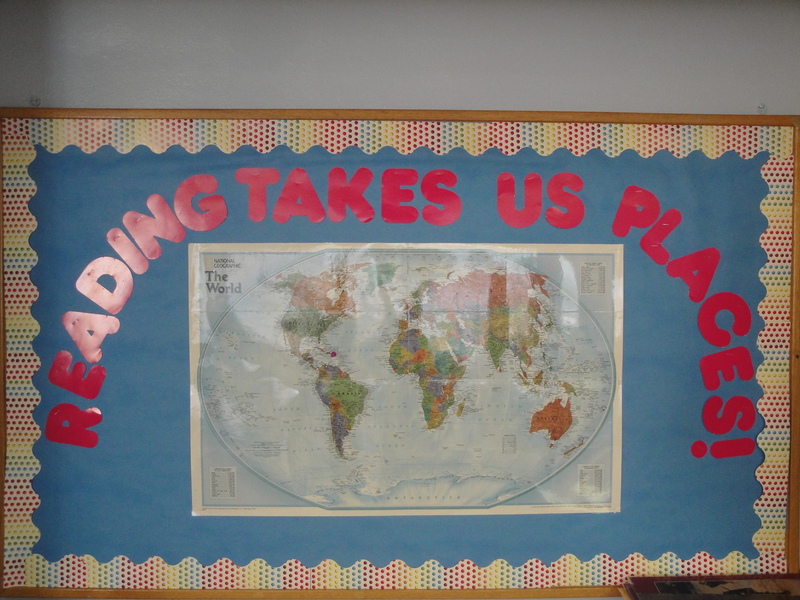 We had several projects planned that the students and I would need help with. They were quite easy to make. I don’t know exact dimensions, but you simply cut a large circle out of fabric. Measuring in about 2″ from the edge, cut small slits every few inches or so. This is where the ribbon gets weaved in and out of. Once the ribbon has gone the whole way around, have the child place the center of the circle on their head and cinch the ribbon until it fits snugly, then tie it off with a nice bow! I like to use thin red ribbon, as I feel this is the most colonial-like. I know it’s not the best picture, but you can at least see how the hat looks when it is not on a child’s head! 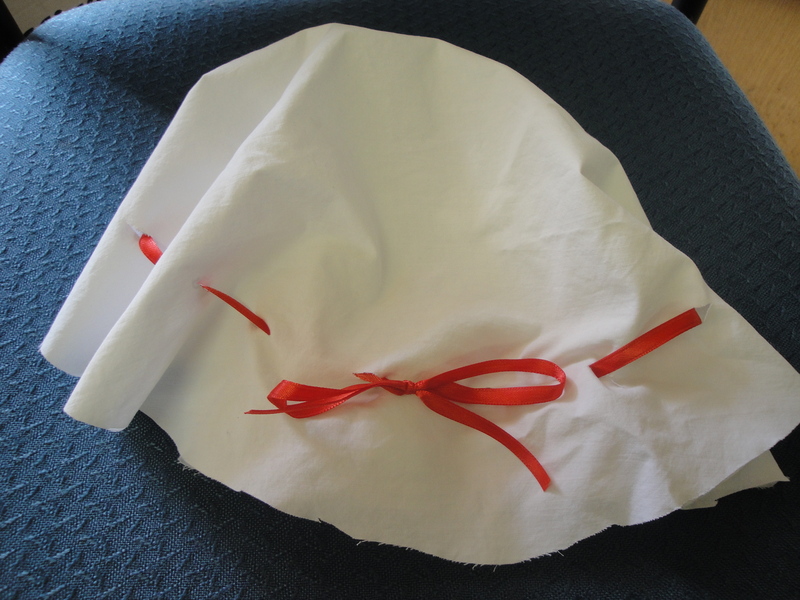 While the students were not working on the hats, they were creating a hornbook like colonial children used at school. In colonial times these were made of wood; letters and numbers were often carved into one side and a small piece of paper with a Bible verse/proverb was attached to the other side. Do you know why they are called hornbooks?? Colonists used to take the horn of a bull and peel away the outside layer, which was very transparent and provided protection on the wood plank – hence the term “hornbook”! To make these, I had a parent cut hornbook shapes out of cardboard ahead of time. The students then took a small piece of paper and, in their BEST handwriting, wrote out the alphabet, numbers, a Bible verse, and other appropriate things. They attached these to the front of the cardboard and placed a piece of wax paper on top to simulate the layer of horn. They measured out 4 pieces of ribbon to fit around the edge of the paper as a border, then punched a hole in the handle and tied a piece of yarn that would allow them to be able to wear it around the neck as the colonial children did. 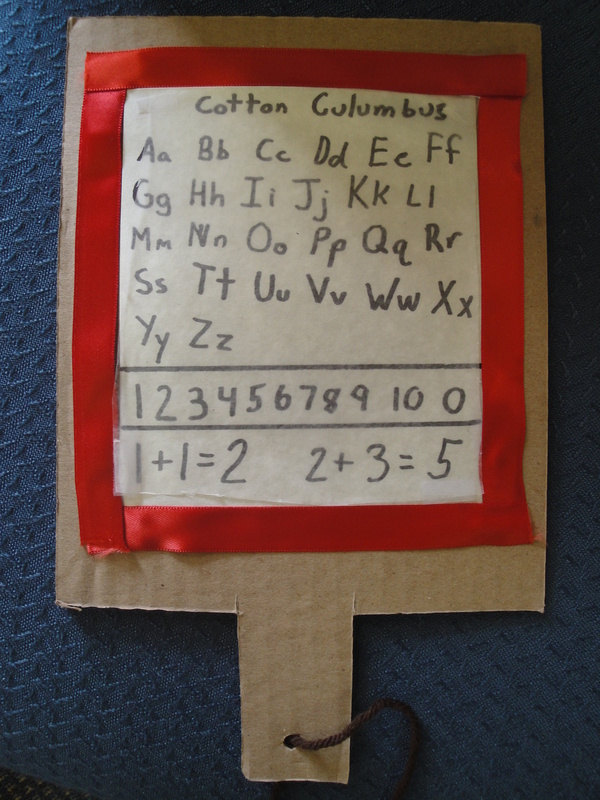 Here is an example of one student’s hornbook – yes, this child’s colonial name is “Cotton” 🙂 PS: The kids got all excited today when they found a picture of an actual colonist named Cotton in one of the books on colonial times in our classroom – they were all yelling to their classmate to make sure he got to see it! So cute! On Friday, we enjoyed some colonial homemade food; We made both johnnycakes and homemade butter. I split the kids into two groups and had one parent leading each activity, so while one group was making the johnnycakes, the other was making the butter and we switched after both foods were ready to be eaten. This was a great activity to tie in math skills with measuring for the johnnycakes! The kids also worked on a worksheet while shaking the butter where they had to try and match the colonial kitchen tool to its purpose – not nearly as easy as it seems! We cooked the johnnycakes on an electric griddle which was perfect because they cooked quickly. We served them with honey – delicious! The kids loved them and could have scarfed down 10 more! The butter simply involved shaking a jar of heavy cream until it turned into something butter-like. One of the parents had baked fresh bread for us, so we enjoyed the butter with the bread. Most of the kids liked it; we had enough that they were able to take some home to share with their families. We talked about how this butter is different from the kind they purchase at the grocery store. 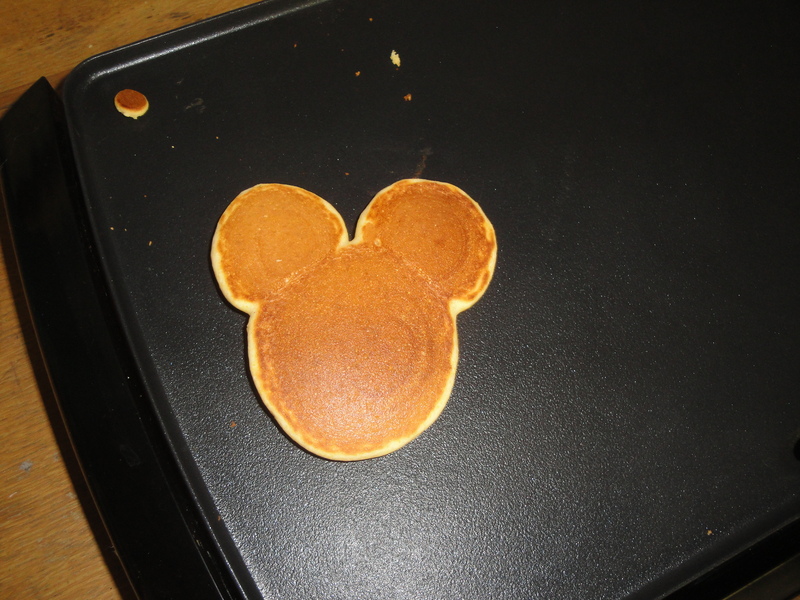 Here is one of the johnnycakes – we had a little left over, so they asked me to make Mickey Mouse and I couldn’t pass up the opportunity. Looks good, doesn’t it?! 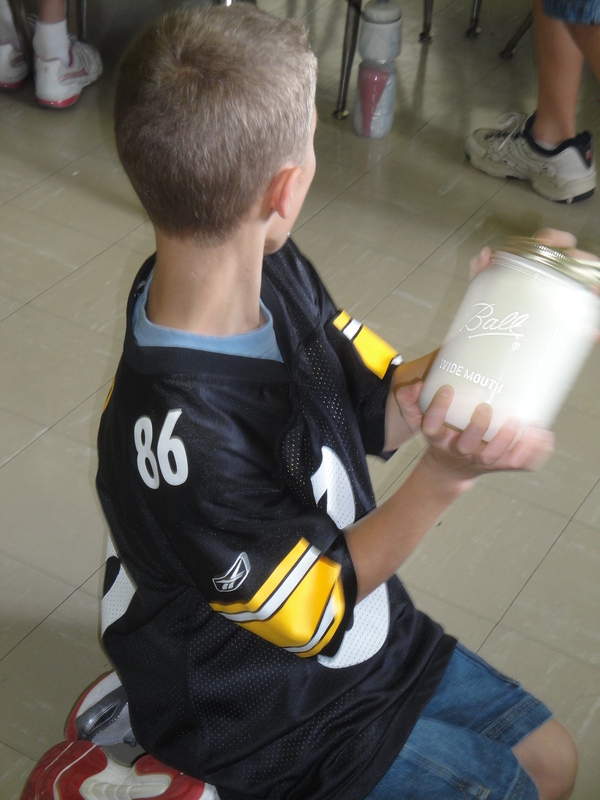 Here is one of my students busy shaking the butter jar. They took 2-minute turns and were complaining of sore arms after only 30 seconds! Have you ever felt like you were bugging your students’ parents to provide materials for your classroom activities? That’s how I felt last week. 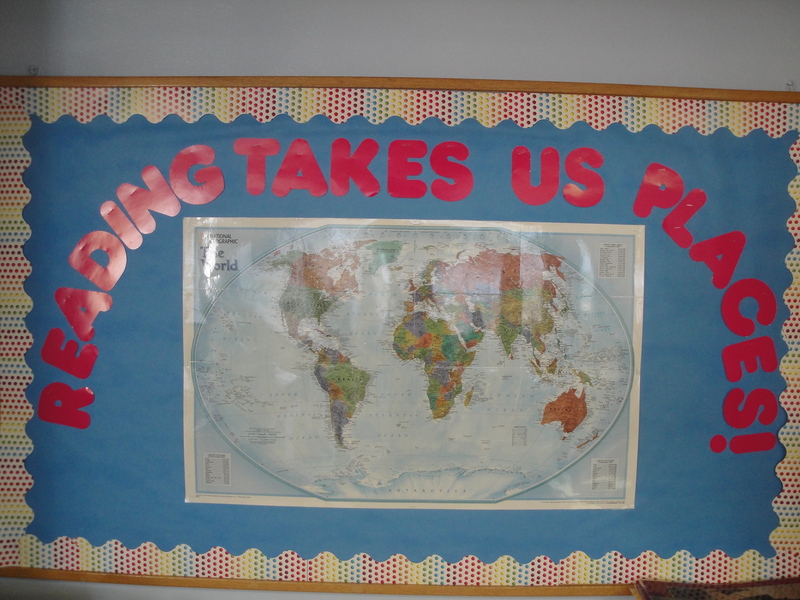 It’s especially evident at a small school that relies on the parents to help run the school! I had plans for our class to take on a new project, one that I had never done with any of my classes before: an archaeological dig. I got the idea from the newly-purchased Colonial America unit found on http://homeschoolinthewoods.com/. I had been looking for a way to revamp my Colonial unit and this seemed like the perfect way to do it – focusing more on what colonial life was like and less on specifics of each colony. 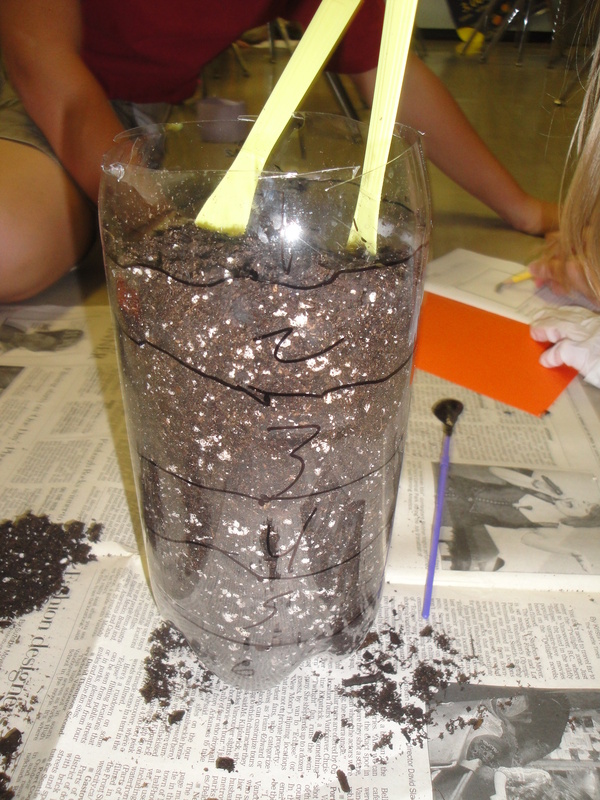 One of the activities included in this awesome unit was an archaeological dig using soil, 2-liter pop bottles, and trinkets such as buttons, coins, beads, and other small things to dig up. I thought this was a great way to focus on how information about the past is learned while still having fun! After a week or so of asking parents for the necessary materials, I finally got the activity ready to complete today. The students first measured 1.5″ increments from the bottom of the bottle to the top. They connected their dots and labeled each level. I then filled each bottle with lots of soil, adding random trinkets throughout and firmly packing down the soil. The students, split into pairs, each received a bottle, some newspaper to put on the ground under the bottle, a latex glove, a paintbrush, and a plastic knife. They were also given an archaeological journal, created from a master provided in the unit. As the students dug through their bottle layer by layer, they recorded their findings in their journal. I had them pretend to be from the future, finding items from today’s world. They had to describe the object, illustrate it, make observations about it, and think about what it might have been used for. Not the best picture, but you can at least see the bottles full of soil with the levels marked out. 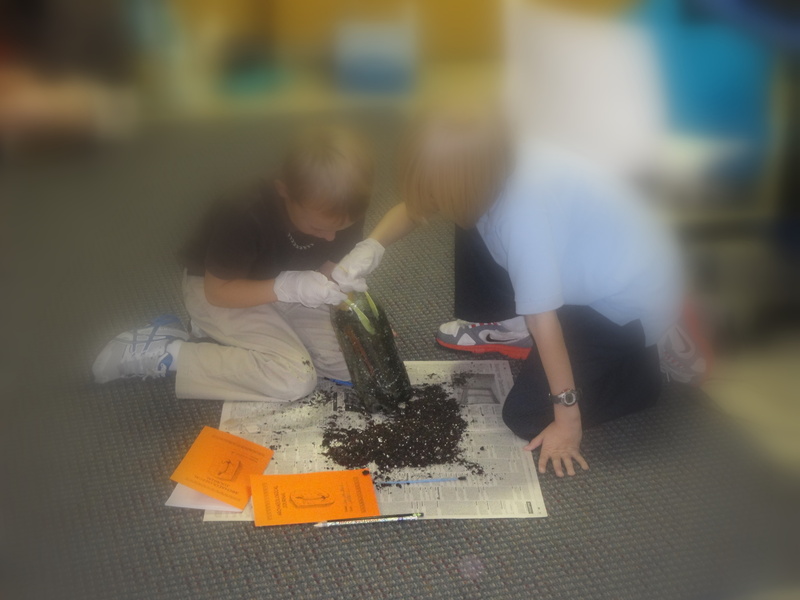 Here are two kiddos hard at work on their dig (edited for privacy). October is such a fun month for us in 5th grade. We spend the month learning about what life was like for the early settlers. We begin each month by establishing our colonial families. I arrange the kids’ desks into groups (their “family” for the rest of the month) and each student then chooses a colonial first name, and the family chooses a last name. We make journals out of special, old-looking paper and yarn where the students write entries throughout the month. Their first journal entry always describes why they chose to come to the New World – maybe they are in search of gold? Or maybe they’d like religious freedom. Whatever the reason, they describe it in their journal. After the families have narrowed down their list of belongings, we then get ready for the voyage. We travel to a different area of the school, somewhere that the kids can be tightly packed in. I read them a paragraph describing their 3-month voyage on the ship, and when we “get off” the ship, we always pretend to have shaky legs from being on the ship so long! 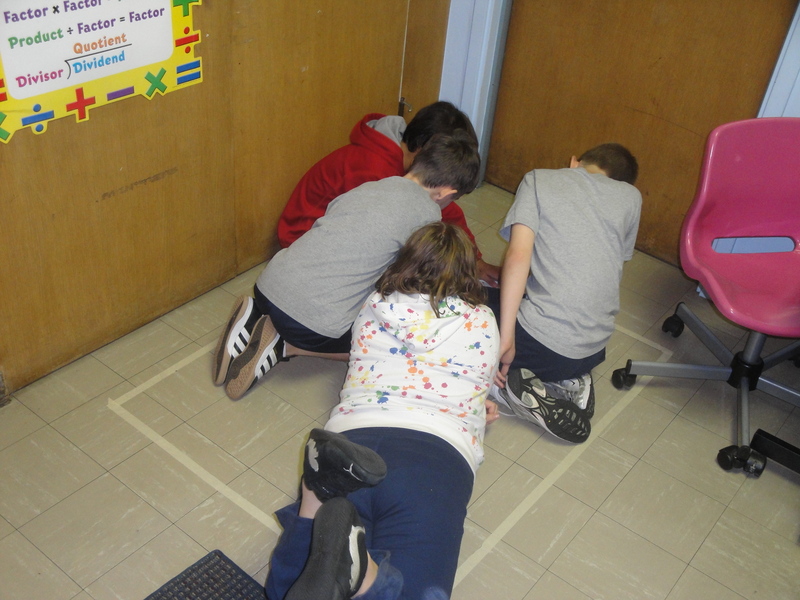 We make our way to land (aka the classroom) where the students are asked to find a place to settle. Each family usually chooses a different corner of the room. They are then given 4 resource cards. These cards may include things like berries that allow them a few meals, an abandoned wig wam to sleep in tonight, or an unlimited supply of water. They are allowed to trade cards, but only going through the “governor” (me!) first. That usually gets us through our first day of Colonial America. The students love being actively involved and are still learning about what life is like in the process. Soon I’ll describe the next day of our simulation which is the kids’ favorite – hunting! Here is one family deciding what to bring in their trunks! Last year, I was searching for an exciting way to teach my April unit on the Middle Ages. When I was in elementary school, I would have considered this an extremely boring topic, and I didn’t want my students to feel the same way. After much research, I came across the site http://www.homeschoolshare.com/ where I discovered lapbooking. Lapbooks are often used in homeschooling. 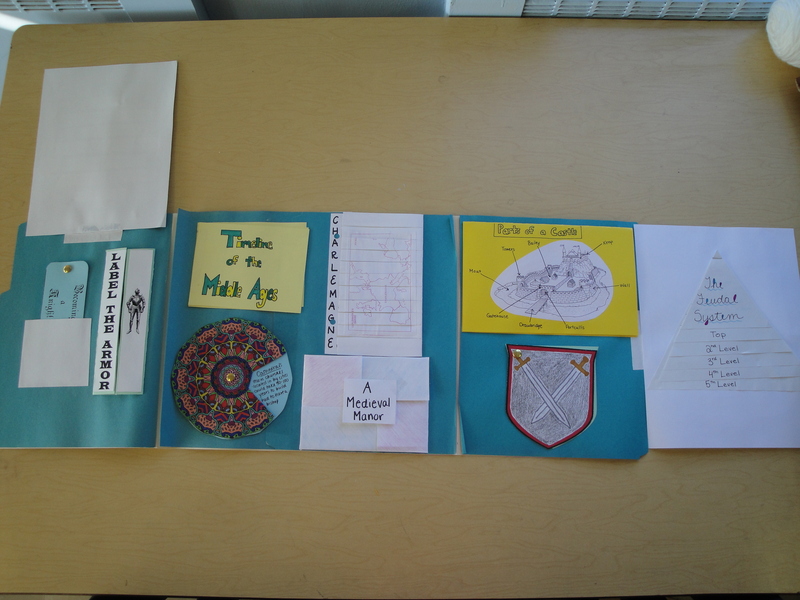 They focus on one broad topic (such as the Civil War), and all of the information learned while studying that topic is made into mini books (such as generals of the war, a map of the battles, a timeline, etc.). 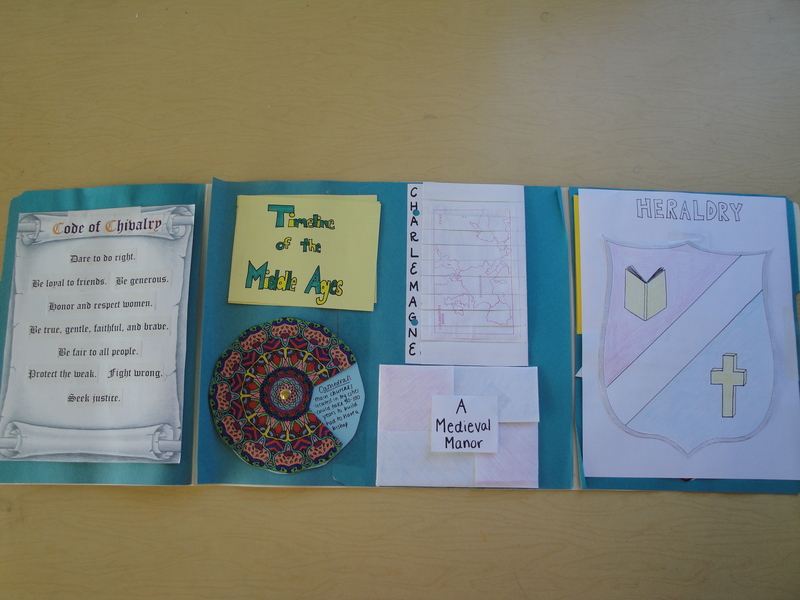 Lapbooks are made by putting all of the mini books into two (or more) file folders taped together. 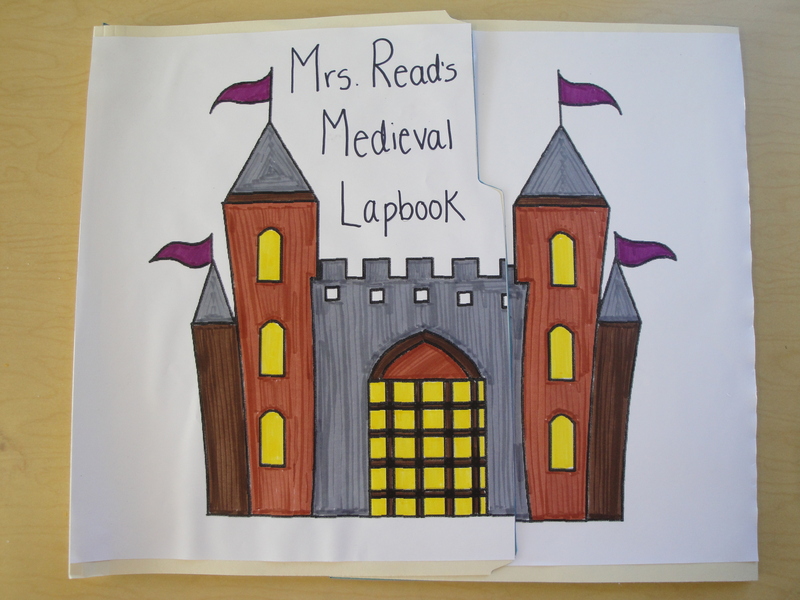 I decided that this would be the perfect time for incorporating lapbooking into my classroom. I was able to find a few templates for premade “medieval” mini books, but the rest I came up with on my own. Each day, I taught my students about a different aspect of the Middle Ages by showing a self-made PowerPoint. The students then went back to their seats and I introduced the mini book of the day. We worked on creating the book and then filling it out with the information learned during the PowerPoint. I was curious to see how the students would do on their unit test at the end of the month, as some students had struggled with unit tests in the past. They used their lapbook to study for the test, and I was so incredibly pleased by the results – the lowest score was a 93%! They were the best grades I had seen all year! 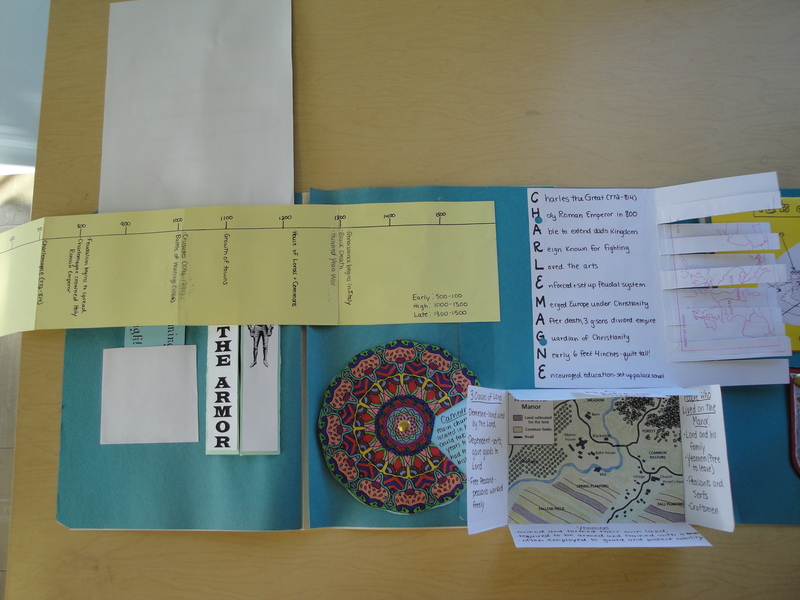 This really proved to me what a useful tool lapbooking can be in the classroom. This is the cover of our lapbook. 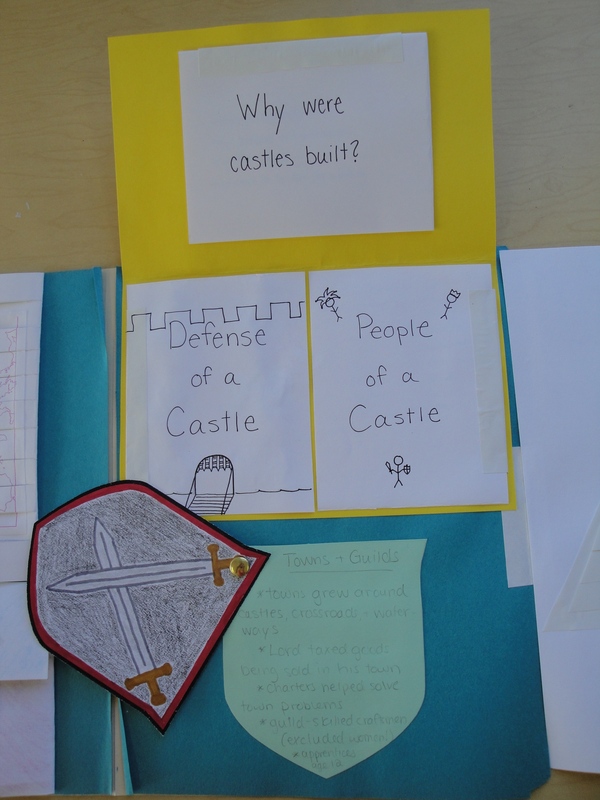 I found a picture of a castle on the internet which we printed off, colored, and glued on the front of our lapbook. The pocket book is for the steps to become a knight. The one on the right is the self-explanatory – parts of the armor. 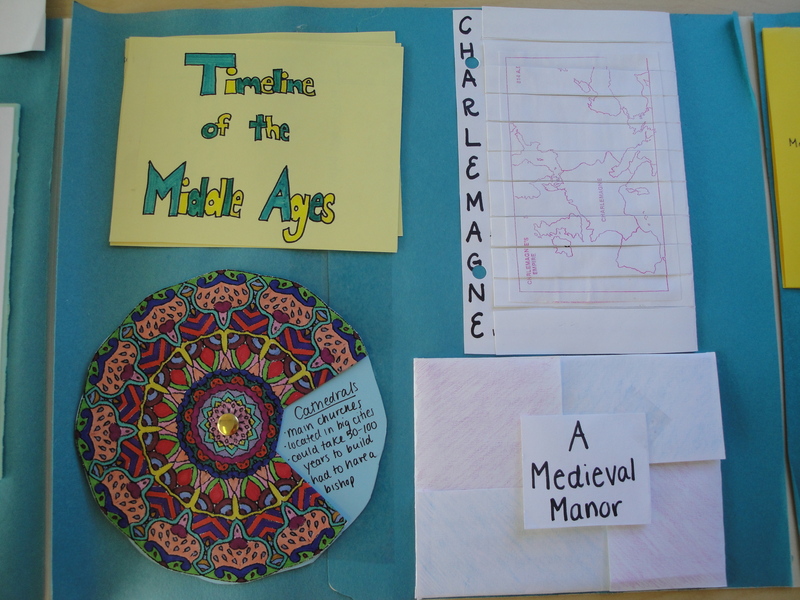 The book in the top left is an accordion book which opens out to reveal a timeline of the Middle Ages. The top right book is an acrostic about the life of Charlemagne – each of the flaps opens up to reveal a different fact about Charlemagne that starts with that letter in his name. It also has a map of his empire on the front and how his empire changed when his sons took over. The wheel book in the bottom left is all about architecture – Gothic vs. Romanesque cathedrals. The cover of the wheel is made to look like a stained glass window. The last book in the bottom right is all about the Medieval Manor. The four flaps open up to reveal different facts about the manor, as well as a map of what a manor might have looked like. Here you can see those four books opened up. The next two books were about castles and guilds. The top book opens up to reveal three smaller books about castles – why they were built, defenses used in castles, and people in castles. 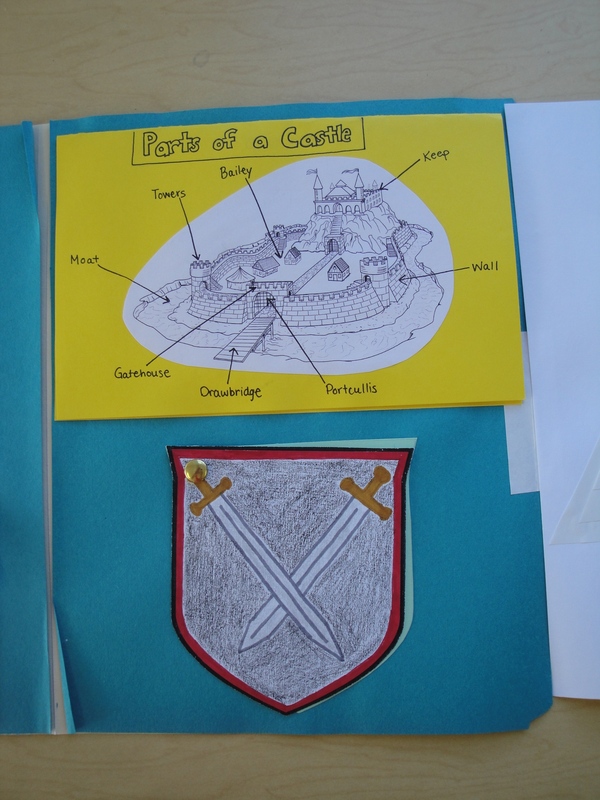 For the bottom book, the kids each designed their own guild sign and wrote facts about guilds underneath. Here you can see the castle book and guilds book opened up. The last flap that opens up has the Feudal Pyramid flap book underneath. 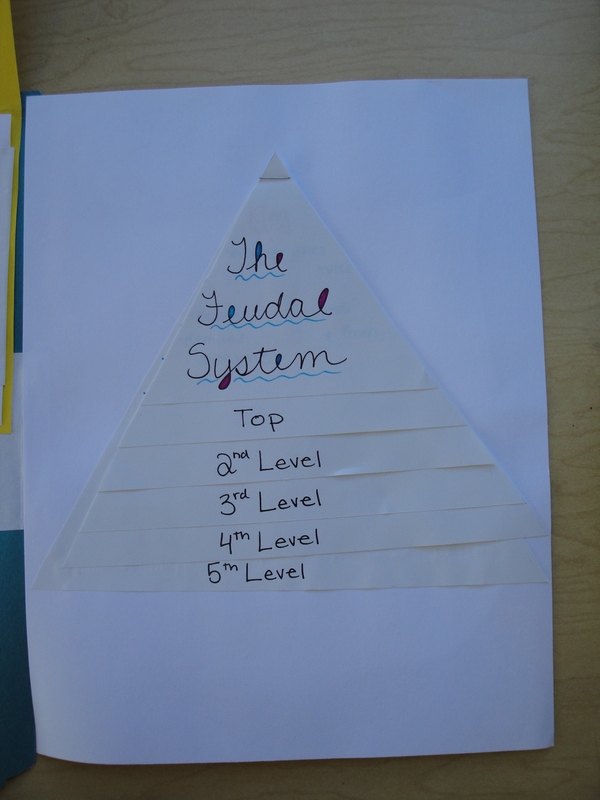 This topic was pretty much made to be a mini book, being that it’s called a pyramid! 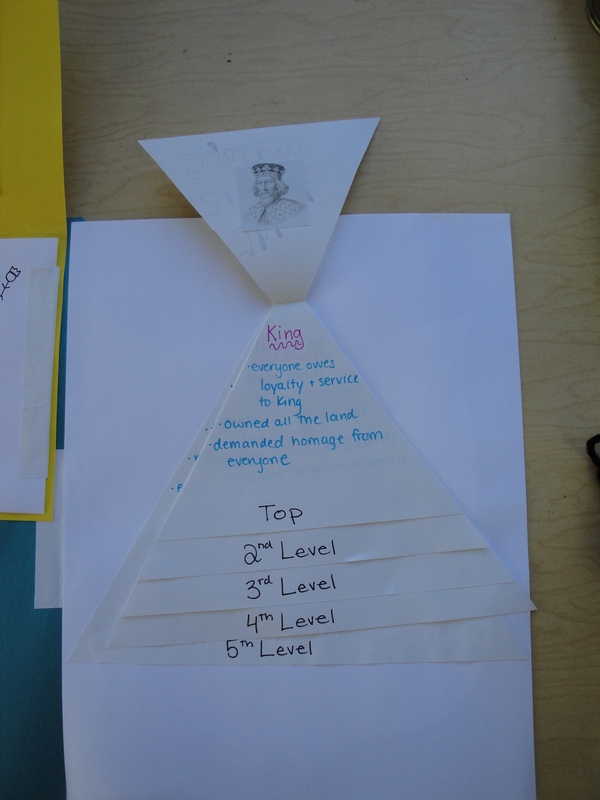 Here you can see the first level, the King, opened up. This is the flap that covers the castle and guild books. 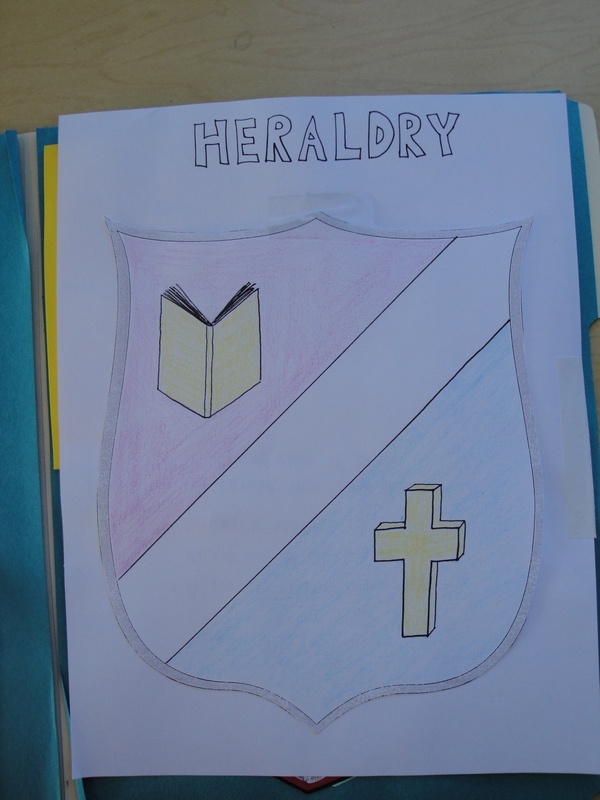 The kids each designed their own coats of arms using meaningful colors and symbols we had discussed. They wrote some facts about coats of arms underneath. 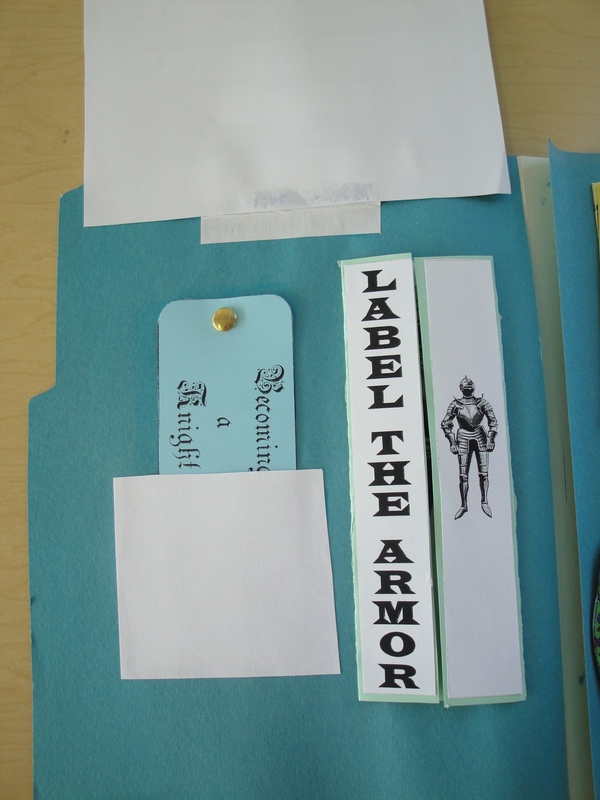 This is the flap that covers the “Becoming a Knight” and labeling the armor books. 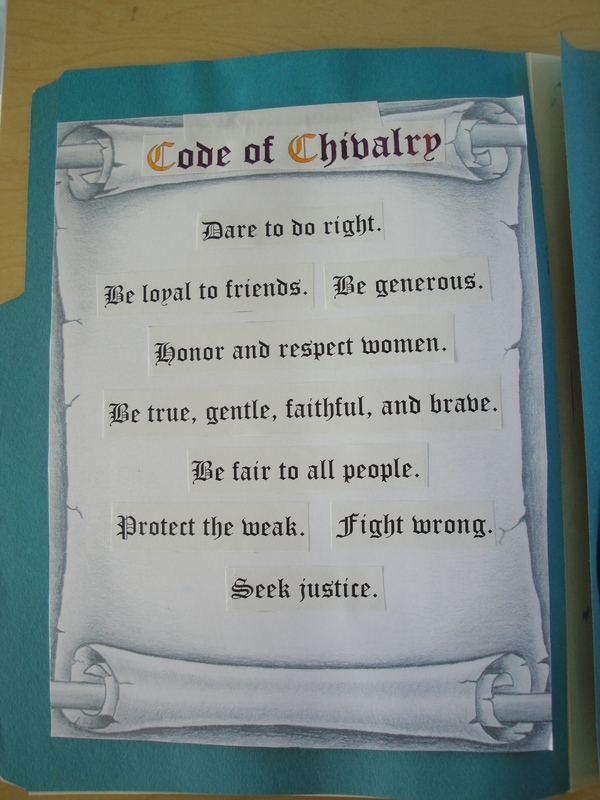 We talked about a knight’s code of chivalry and the different aspects that were included. So that’s about it! I pretty much created the mini books as I went, so I wasn’t sure what it would look like when they were finished. However, the final product turned out better than I expected! I did give the kids a grade for their lapbook, based on how well they followed directions and neatness. They were so proud of their hard work and I still have some of my students from previous years telling me how much they loved this unit! This type of activity proves to me that, while sometimes it takes quite a bit of extra work in teaching to make a difference and help the kids have fun while learning, it is 100% worth every minute!